I decided back in March that I REALLY wanted to throw a dinner party. A grown ups dinner party. My birthday was approaching and I had no care for presents. I wanted a party. A party with food. A party with friends. A party with many delicious things to eat. The brief was simple. Each couple, and my darling friend Sofie, had to bring a small entree sized -finger food even – dish that could be served to the group in designated time slots. Portion sizes were to be kept small, anything that could be served on a board, platter, or small plate, and, please, please, arrive hungry. There was 15 of us. I played a small hand in ensuring all the food groups would be covered. And that the cooking styles varied too. The barbecue, the oven, the deep fryer were all to be put to use. And I knew that these hot smoked trout croquettes just HAD to feature on the menu. And then, the most beautiful of cakes, Passionfruit coconut and lime layered cake with white chocolate ganache (thank you Sarah x). 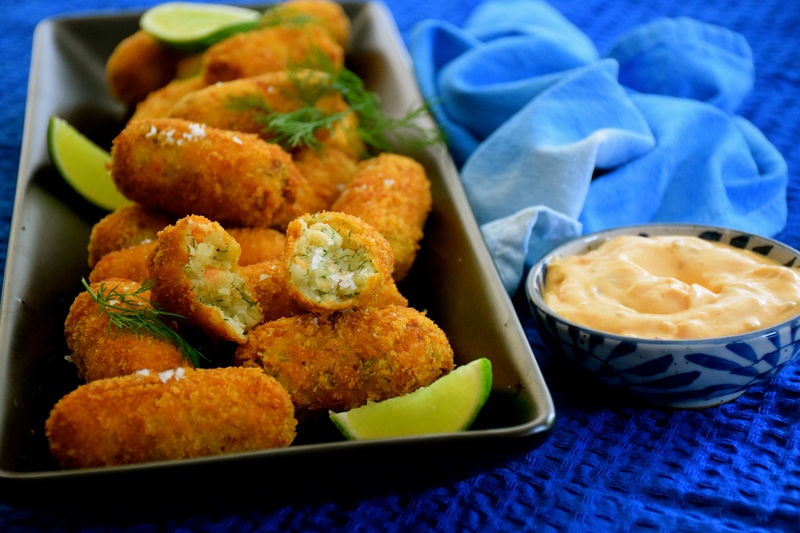 Hot smoked trout is the prized ingredient in these croquettes. Have you ever bought a whole one, peeled away the skin and flaked apart the flesh? It’s one of those amazing convenient products that tastes oh-so-good, is oh-so-easy to prepare, and is oh-so fairly priced. How do I get the mash potato fluffy? Make sure you mash the potatoes whilst still warm. The best way is with a potato rice masher. They make fast work of mashing and give a really good result (no lumps). What oil do you use to deep fry in? I tend to use Rice bran oil or Grape seed oil. Can I make them ahead of time? Of course you can. Prepare them in the morning and refrigerate till needed, but you MUST fry them to order. Can I replace the trout with any thing else? Crab would work nicely here too, but only if you can get your hands on good quality crab meat. Shredded ham hock would also be super tasty. Or if feeding vegetarians, why not replace the trout with 1 cup of grated pecorino cheese. Can the trout croquettes be frozen for a later date? Yes. Freeze them after crumbing but before deep frying. Lay them flat on a tray, covered in cling wrap. Do you have a recipe for the chipotle chilli and tomato aioli? click here for Chipotle tomato relish Add the relish to whole egg mayonnaise and season to taste. The dinner party (and the croquettes) were such a roaring success that I’ve decided there must be another dinner party, in the not- to-distant future, and this same method of sharing food absolutely must be experienced again. Peel then cut the potatoes in quarters. Place in a pot with cold salted water and bring to the boil, cook till potatoes are just soft. Drain and leave in the colander for 5 or so minutes (The steam will naturally dry out the potato). Meanwhile, brunoise (small dice) the onion and cook on a medium to low heat in 1 tbsp olive oil for 5 or so minutes till onion just starts to colour. 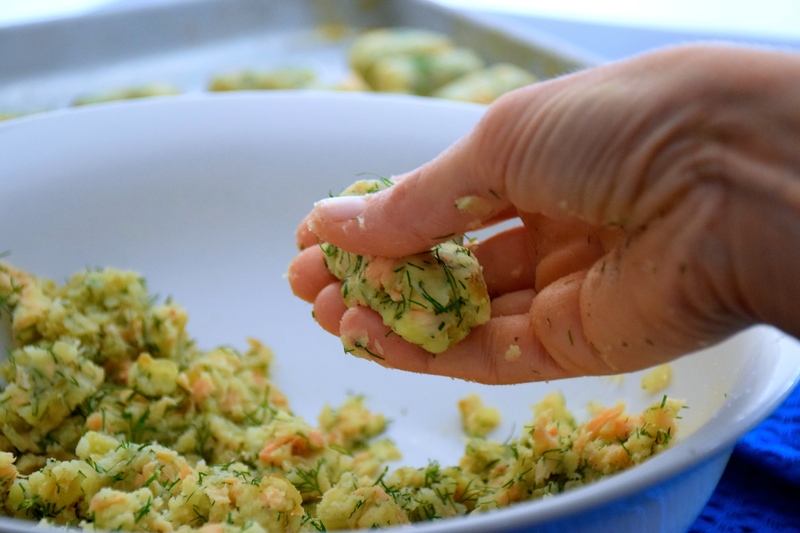 Use a potato rice masher to mash the potato in batches, or mash by hand, try to remove all lumps. Set aside in a large bowl, add the caramalised onion. Cut the tail skin off the trout and slide your fingers under the skin, this should peel away easily. Repeat on the other side. Use a small knife or your fingers to gently pry the flesh away from the bones. Try to remove the flesh in large chunks leaving the bones behind. Repeat on other side. 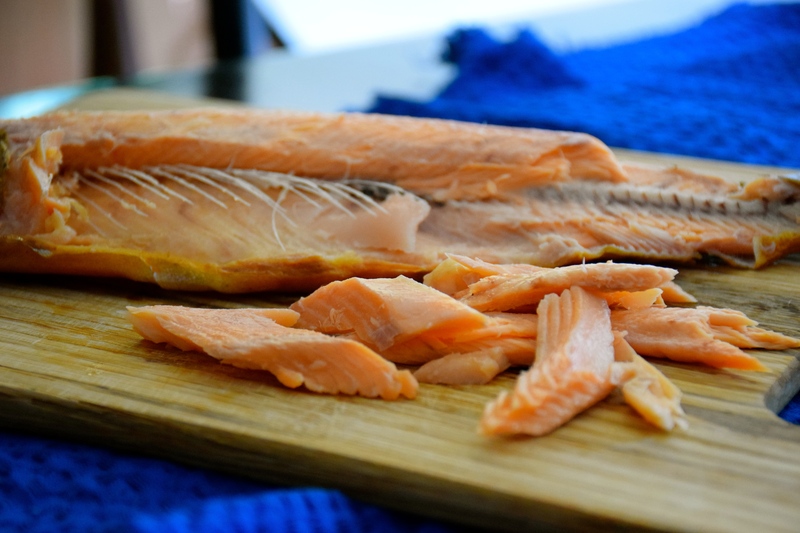 Quickly pick through the trout to remove any bones that remain. 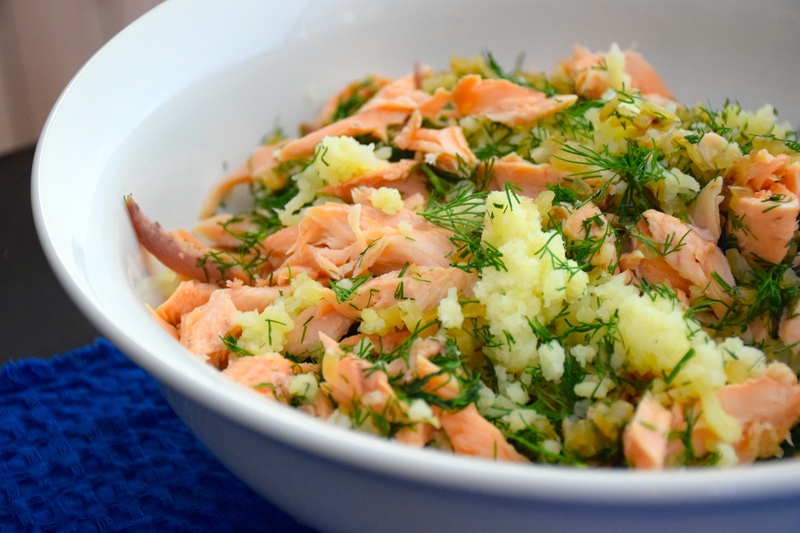 Flake the trout into the potato, add the chopped dill, 1/2 tsp salt and 1 tsp white pepper. Mix to combine. Take a small amount of potato mix in the palm of your hand and shape it into a cylinder type shape. Set aside on a tray. Continue till all croquettes are rolled. Lay out three shallow trays. One with flour. One with the beaten egg and milk. And one with the panko bread crumbs. Work in batches, lightly dust the croquettes in flour, then pass through the egg, then into the crumbs. Continue till all croquettes are crumbed. For the dipping sauce mix the mayonnaise and the chipotle tomato relish together till well combined. Place in a dish for serving. Meanwhile, fill a deep fryer, or large heavy based pan, with rice bran oil. Heat the oil to frying point (180C). Cook the croquettes in batches for about 3 minutes or till golden and crisp. Drain on paper towel. Continue with remaining croquettes. 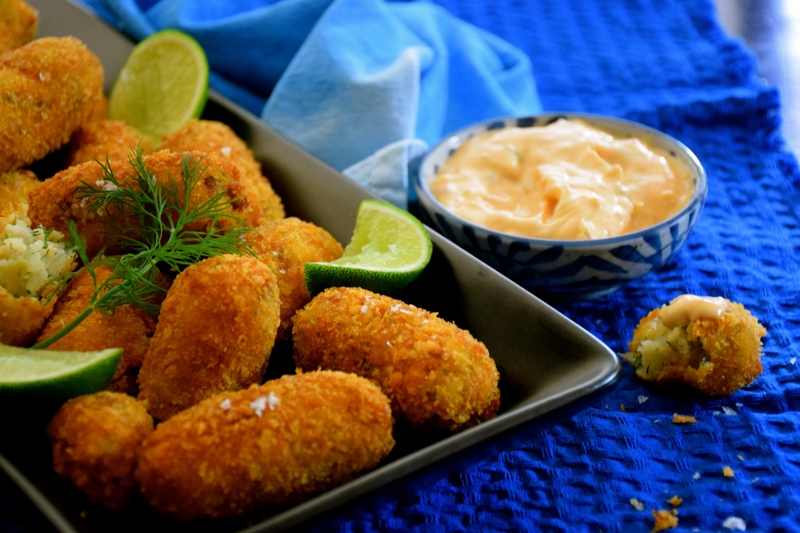 Serve warm croquettes on a platter with dipping sauce and wedges of lime. Great! You won’t be disappointed. These croquettes were the most delicious treats, subtle but contrasty in texture and rich in flavour. Ha, we barely waited for them to be cool enough to eat. Your house next time? Wonderful idea for a dinner party. Sounds like loads of fun. This is such a great idea for a party Michelle – it spreads the work and gets people involved in a common activity…what fun! I had a pizza party once that was similar. The croquettes sound delicious too. These croquetttes look absolutely beautiful. I’m not much into seafood, but I do love trout. 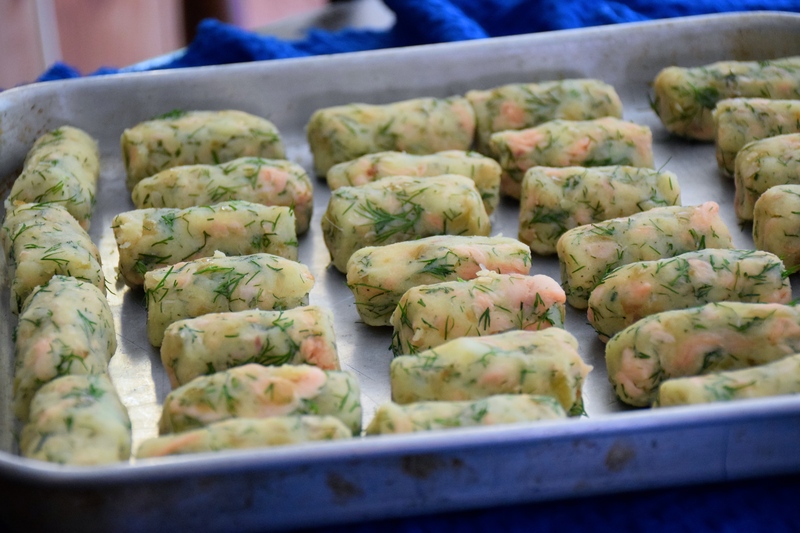 Made with dill and browned onion makes them that much more special.